There were far too many delectable sounding choices on the menu at the Grand Central Café. Narrowing it down to just their breakfast menu, despite it being long past when breakfast should reasonably be consumed, still left my friend and I wanting to order every last one of their mouth-watering offerings. Thankfully, the staff were extremely patient, and let us customise our meals while calculating the cheapest possible way to put the dishes together. Breakfast from Cheltenham's Grand Central Cafe. 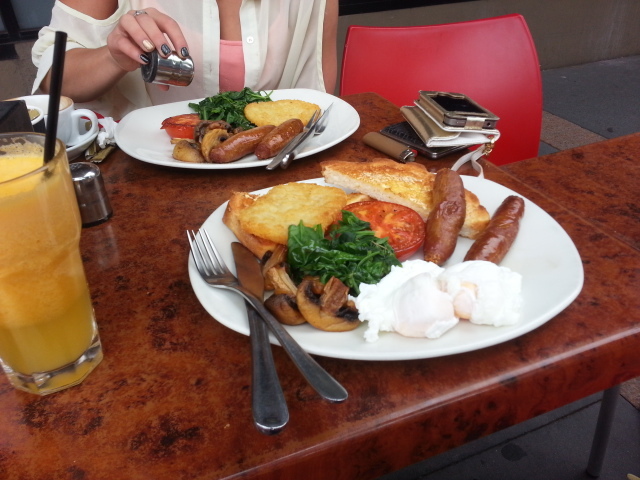 I ordered their breakfast specialty, but customised it, swapping a healthier choice for some greasy hash browns. This was a compromise- I had really wanted their hangover breakfast, which even boasted chips, but reasoned that that may have been a little too unhealthy. Rather than charging extra for the hash brown swap, they retained the original price of $16.50. 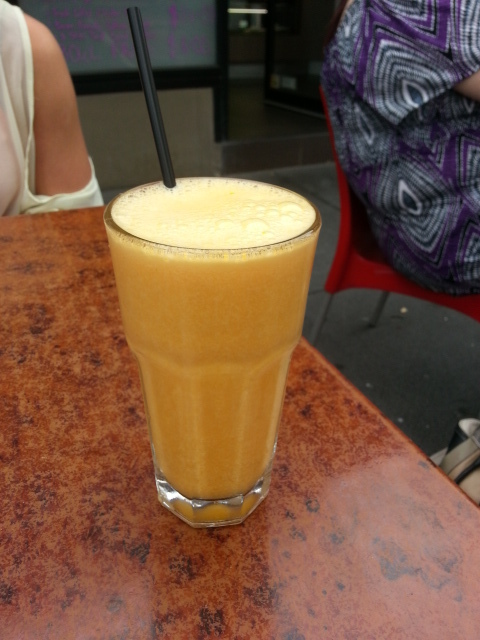 I also ordered a glass of their freshly squeezed orange juice, having heard good things about their juice. It was pricey at $6, but the rumours were true and it was worth every cent. My friend wanted a breakfast dish, but without the eggs (she's hard to please). 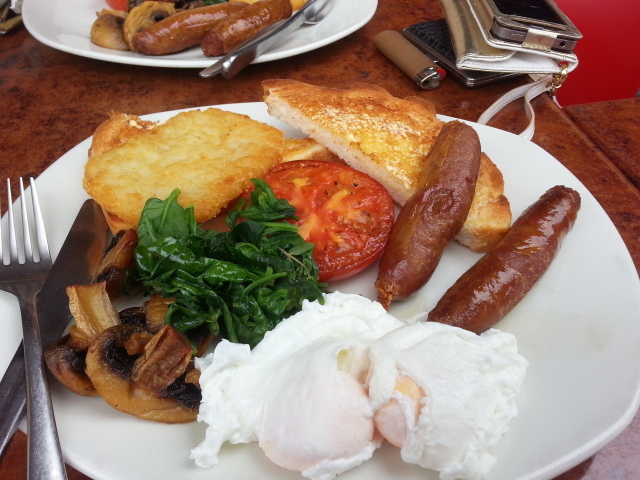 They put together just the dish she longed for, with sausages, hash browns, spinach, tomato, and mushroom, which cost about $15. There was nothing in particular that stood out about the breakfast; it was all exactly as expected. There were no nasty surprises, but it was quite a standard café breakfast. The serving size was more than ample, and everything was cooked to perfection. Freshly squeezed orange juice from the Grand Central Cafe. Exterior of the Grand Central Cafe. 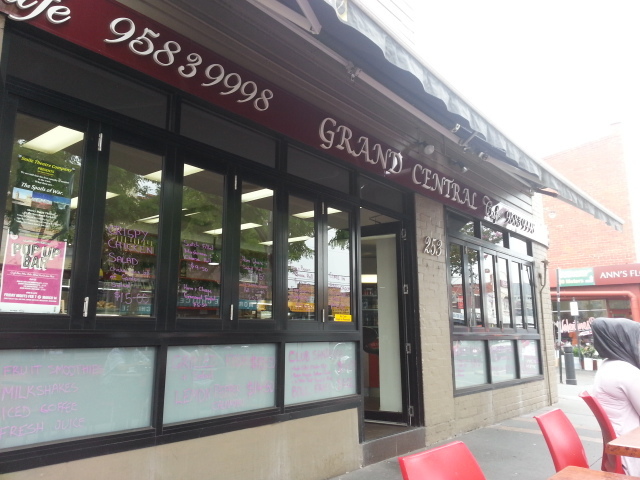 The Grand Central Café is located beside Cheltenham Railway Station, and is a short stroll away from the gargantuan Southland Shopping Centre. Why? For that incredible orange juice (although the food was good too). When: Breakfast and lunch, seven days. Where: 253 Charman Rd, Cheltenham 3182.